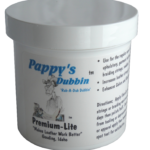 Pappy’s Premium-Lite Dubbin AKA Liquid Dubbin is off-white or ivory in color and works well on upholstery or garment leathers. It is not only great for thin leathers but I soak saddle strings, lacing strings or braiding strings in it for an hour or two or over night, squeegee it off between my fingers, let it cure for a couple days or just use it wet if pressed for time. My favorite leather for saddle strings is dry Indian tan latigo. Soaked in Premium-Lite Dubbin, it makes strong and beautiful strings. This is a very versatile product and is very creamy and nice to use. I personally use Premium-Lite nearly every time I do leather work. Like Premium, this product will often firm up or add body to overly soft leather. You can soak leather completely through or apply just a small amount from the tip of your finder. This product doesn’t water proof or increase water resistance, it only increases the leathers ability to stay healthy and prevent cracking. Use this product on hard, dried leather before you wear it or bend it to help avoid cracking. Of course, there is a time when leather is too dry and will not re-hydrate but with this liquid dubbin you can soak or apply multiple times to get the leather to accept moisture back in. Apply this or Premium Dubbin to leather that gets wet, like boots, to protect the leather from pulling on stitching, and shrinking, and getting hard while it is drying. Doing this will prevent much unnecessary damage during the drying process. 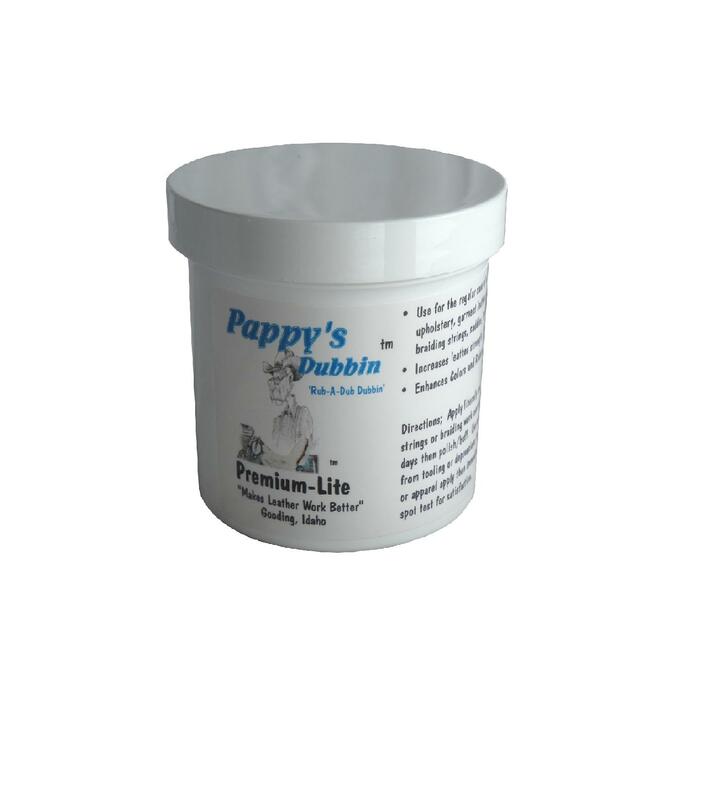 16 oz is recommended because it is less money per ounce both purchase and shipping. The Gallon works best if you are planning on soaking items.